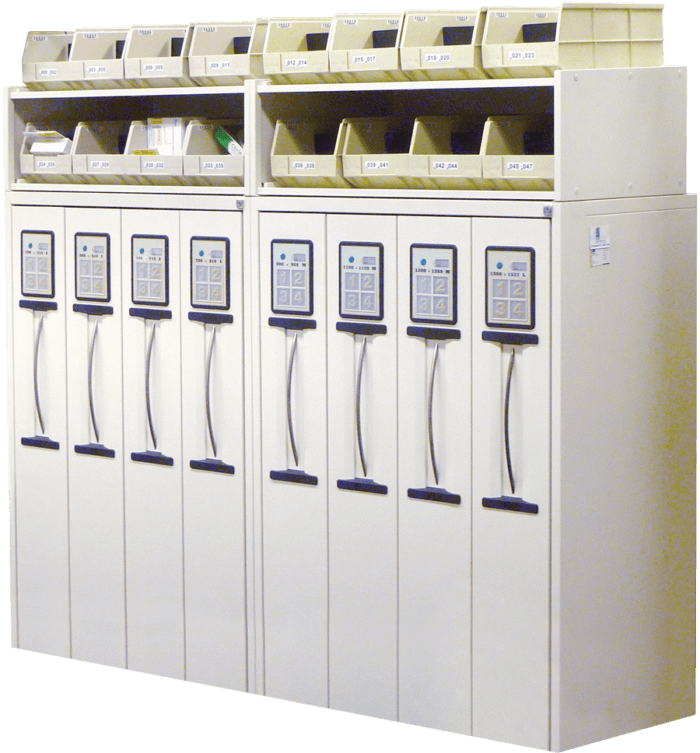 IntelliCab™ Will-Call System - Pharmacy Automation - Manrex Ltd. Revolutionary automated RFID “Will Call” solutions for high volume dispensaries. Manrex is pleased to be the exclusive Canadian Agent for the IntelliCab™ Will-Call System from GSL Solutions, Inc. The IntelliCab™ System from GSL Solutions, Inc. is equipped with radio frequency identification; RFID, the IntelliCab is an intelligent system designed to provide unparalleled safety and worker efficiency while providing user accountability as you identify, track, store, and accurately retrieve every prescription – every time! The System combines standard RFID tags (affixed to SmartBaskets™) with GSL’s proprietary RFID readers, unique lockable electronic cabinet design, three-dimensional storage drawers, and real-time IntelliSys™ tracking software. The sleek, uncluttered design of the IntelliCab System creates a professional appearance which is HIPAA-compliant, and very easy to use. Once installed, your IntelliCab will virtually eliminate filing and retrieval errors, annoying waiting lines, rummaging through hanging bags or drawers, and dissatisfied customers. With IntelliCab your will-call pharmacy operation will be more productive, more efficient, and much easier to manage on a day-to-day basis. Streamline your pharmacy workflow, improve accuracy, reduce costs, and deliver outstanding customer service. GSL’s IntelliCab and IntelliSys brings unparalleled Safety, Speed, Customer Service, and Security to your pharmacy operations, combined with a space saving footprint and compelling cost savings.